Although I’m not a huge “twitterati,” I check in every Friday to join in Friday Reads (#fridayreads), a meme created by Bethanne Patrick (@thebookmaven) which invites you to simply share the title of whatever you’re reading on that particular Friday. Bethanne’s hope is that the meme “bands us together in the shared joy of reading and encourages us all to read more.” The list of participants keeps growing week to week (now regularly topping 2000) and I enjoy seeing what others on my Twitter list are reading. 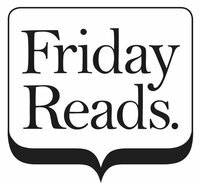 If you don’t Tweet but would like to join in, Friday Reads now has a Facebook page where you can post your weekly read. Plus, The Book Lady’s Blog has now become the official blog partner of Friday Reads, making it easy to join the fun by simply leaving a comment. Along with the opportunity to eye some new reading materials and add to your TBR list (what reader among us isn’t always dying to do that?? ), Friday Reads offers other fun things like prizes and charity donations. The push is on to reach 5000 participants, at which time The Bookmaven will donate $250 to the First Book program. Tell us what you’re reading. ~I’m reading This Body of Death, by Elizabeth George, who writes one of my all time favorite mystery series. Am reading Mr. Rosenblum Dreams in English by Natasha Solomons. It’s about a German Jewish couple who emigrate to England at the beginning of WW2. Ah, I’m a little out of date but I was reading Richard Bausch’s Thanksgiving Night, which was absolutely wonderful.